Ducks Unlimited conserves habitat at the continental scale to meet the lifecycle needs of North America's waterfowl. Maryland is part of the Atlantic Flyway, providing important migration and wintering areas for many of the continent's waterfowl such as American black ducks, mallards, canvasbacks and Canada geese. 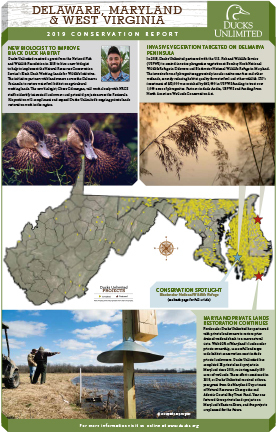 Working with a variety of partners, DU's Maryland conservation program restored, enhanced and conserved 4,851 acres of wetlands and adjacent habitat. Maryland's conservation projects are designed to maximize the amount and quality of migration and wintering waterfowl habitat as well as improve conditions for waterfowl production. View the state conservation report in Maryland.